When we talk about angels operating among us, the spiritually unenlightened think it’s just religious sentiment. That’s because they allow their intellect to neutralize their faith. Notice: 1) Angels have a long history among us. An angel shut the mouths of lions for Daniel. An angel went before Israel’s army guaranteeing their victory. An angel showed up in a storm to let Paul know that he’d survive a shipwreck. An angel opened prison doors for Peter, saving his life on the eve of his execution. 2) Angels protect us in times of danger. And when you consider some of your ‘ways,’ don’t you realize just how much you need protection? Your early cancer detection, or your narrow escape—those were more than just lucky breaks. Angels even watch over our children. Now you know why kids survive things that make parents go weak at the knees. 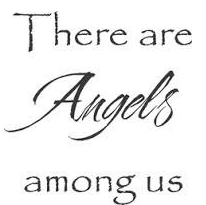 3) Angels help us in times of need. So, has God done away with His secret service? Are they sitting on their hands collecting unemployment somewhere in heaven? No, they’re still working hard. You may not be able to see them with your natural eyes, but the benefits they bring surround you every day. Angles were guiding me the other day when I went to get lunch. I went to one subway and it was busy with families and children so I got the urge to move on. I went to a second one same story again the urge to move on. Finally, I went to Quiznos and it was not busy and there were two emt’s there having lunch. I was able to ask them about their work schedule and told them I am interested in being a P. A. but needed clinical experience. They said I should become an Emergency Room Tech after I take my EMT training and that would look better on my P.A. application. See angels even get involved in guiding us to get information for future plans!!! I totally agree. Angels are very much at work today as much as ever. However unless it’s a “God sent message” they can’t intervene unless we ask. So just start asking for their help. I’ve heard they’re just waiting to jump in for us. Until we ask for their help they’re whispering suggestions—-which are easy to overlook.